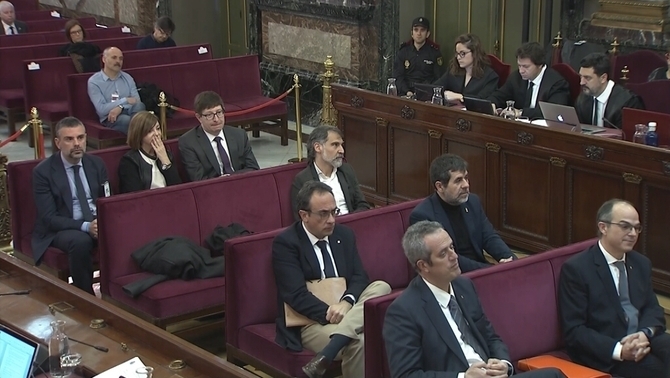 Two other agents describe the exit of the Unipost registry in Terrassa the previous day as a "mousetrap"
The fifth and last witness of this Thursday's morning session at the Catalan independence trial at the Supreme Court was that of the agent identified under police ID number S17971T. This agent made a photographic report of the warehouse of Bigues i Riells, where the Guardia Civil found 10 million ballots for the referendum. 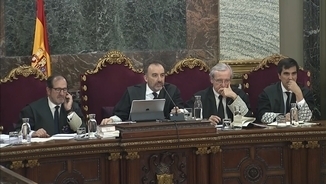 As he stated, when they had to leave the place, the court secretary asked them to remove the vests that identified them as Guardia Civil agents, because the people gathered on the outside were very upset. Agent S17971T: "Yes, that's right, I remember he said: 'Please, do you have anything I can cover my face with? Because I don't want to be recognized.' And a fellow police agent, the sergeant, gave him a handkerchief with which he covered his face." Moreno: "Therefore, was he covered?" Agent S17971T: "Yes, he completely covered his face because he was afraid. I mean... he had reasons to be, because the people there were quite exalted. Now, truth is that I have not lived myself the Basque conflict, thank God, but my veteran colleagues told me that the situation we were facing there resembled the one of the Basque conflict, that both were very similar. That people..."
Marchena (interrupts): "Let's ask another question, please." 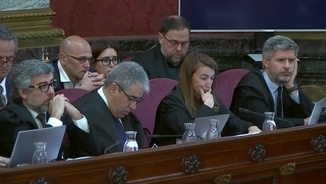 Marchena (cuts him off): "Another question, please." The third and fourth agents of the Guardia Civil who declared took part in the searches at the company named Unipost in Terrassa on September 19, 2017. Asked by the same prosecutor, Jaime Moreno, agent H12669K explained that they did not need to register way too much, because the boxes were found right next to the loading dock of the company. "They were white envelopes, (and) in the upper left margin (there was) a logo of the Catalan Government (Generalitat). The envelope had a transparent, plastic window, where you could see the name of a person, an address, a zip code and a town. " Agent H12669K: "They waved Catalan pro-independence flags (estelades), they shouted, they sang, they were sitting on the floor... They had a cardboard ballot box, they put it there, among the people ..."
Moreno: "Were there any insults?" Agent H12669K: "Yes, there were insults..."
"What was surprising, or at least it was to me, was that instead of going straight, we turned the next street to the left, which was where the people evacuated at the beginning were still gathered." "And they lead us to a street that was completely under construction, everything in it completely raised, ditches covered with iron sheets, fences, ruins,..."
"We were astonished to see that they lead us into a street where... well, it was a mousetrap." 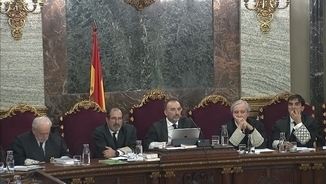 Questioned by the prosecutor wether he considered it "a trap" set by the Mossos, the witness restricted himself to saying that it was "unparalleled". The agent said that the people gathered followed them down that street and that there were times when they "were completely glued to the glass of the car." He also assured that there were people who lifted the plates of the ground so that their vehicles would fall into the ditch. I just saw the reflection of hatred for the first time in my professional life. I saw it in the faces of those people." 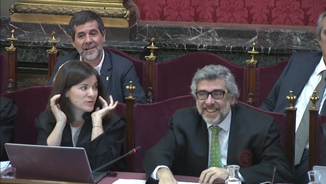 Asked by Jordi Pina, defence counsel of Rull, Turull and Sanchez, the agent admitted that the people gathered there did not try to enter Unipost while they were proceeding with the searches. He has also admitted that he did not need psychological treatment because of what he experienced when confronting the "faces of hatred" he faced among the people gathered there. "I had not seen anything like it in my life"
A very similar story was the one related by the following witness, Guardia Civil agent under Police ID number S00885Q, who also took part in that same operation at Unipost. This agent explained that the people gathered here cut the street in both directions. "There were all kinds of actions: insults, threats, chants, recordings of all kinds, even in front of the car park I remember that they placed a TV camera, so we didn't know where to put ourselves so that we wouldn't be filmed. A lot happened there. I never experienced anything quite like it in my life." "Truth is that when we arrived... it was a mousetrap. When we reached the street, we found that it was a super narrow one, under construction and with all that was necessary to prevent the judicial committee from passing. Again..."
Twenty minutes in the "mousetrap"
This witness stated that the people gathered threw to the ground the fences that were there, so they had to stay for 20 minutes on the street under construction. He also ensured that "every car that passed through there fell into the ditch". He also explained that the Mossos "collaborated" with them, "using force to drive the masses away" so they could finally pass. The agent said that people did not shake the vehicles, but they recorded them with cell phones and covered their faces so they would not be seen.